More like Castle Greenskull, am I right? Green, gray or even purple, He-Man's homestead is represented here in stunning detail by Icon Heroes. This statue stands nearly 10-inches high, which may make it a tad on the small side if you were hoping to populate Grayskull with your Matty Collector MOTU Classics, but it would still make a fantastic centerpiece. 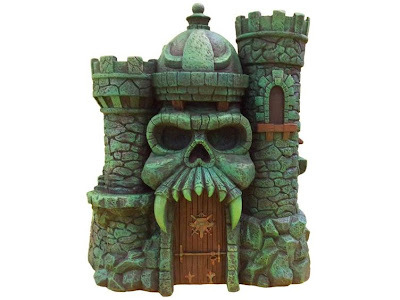 BigBadToyStore has the Castle Grayskull statue up for pre-order right now. Look for it to arrive in March, but to pre-sell out long before then. Checkout the BBTS website for photos of the statue from alternate angles.